A drywall work can be a DIY project so be sure you have all the essential drywall tools to complete the job in one go. Fortunately, the tools you’ll need for this task will also be used in other home improvement projects so it’s a good idea to invest in them. Besides, you won’t have to worry about breaking the bank since you can find many affordable drywall tools. To help you with your drywall task, here’s a complete checklist of the right drywall tools to keep stock of. Some people refer to these drywall tapers colloquially as drywall tape banjos. Others have referred to them as mud guns. Whatever your preferred phrasing is, you just need to know that this is a very convenient drywall tool that is going to save you a lot of time. Applying drywall tape is something that can take a bit of time but the process can be whittled down to mere seconds when you own this tool. Professional drywall businesses always have these tools handy. It makes the process of preparing drywall a lot more manageable. When you can save yourself some time and effort, it is a good idea to jump at the opportunity. These drywall tapers are not difficult to use, either, so you will be able to get the hang of it very quickly. If you are on a budget, then you may want to avoid buying a drywall taper. They aren’t outrageously priced or anything, though. You can get one for a reasonable price and it will help to make your drywall job a lot easier. It can’t be considered an absolute necessity but it is definitely something that is high on the list of priorities when you value your time. Drywall mud is going to be the most important thing to purchase when you have a drywall job to do. This is definitely going to be something that you will be seeing a lot of until the job is finished. You want to make sure that you have as much of this mud as you will need to complete the job. It’s always better to buy a little more than you need than to have too little so do your best to purchase the right amount. The mud is going to come in very large buckets. These can be a little bit heavy but they won’t be too hard to transport. You can buy all of the mud that you need from the hardware store. It shouldn’t cost you too much money and you will be prepared for the job at hand. Buying a good mud pan is an essential part of doing a drywall job. You need something reliable that is going to be able to hold all of the mud that you need to use. Thankfully, most hardware stores are going to have plenty of different mud pans that you can choose from. You should be able to find them in multiple sizes so just be sure to get one that is large enough to suit your needs. These mud pans aren’t going to cost you much money either. It is smart to just go ahead and buy one to make the job that much easier. You could repurpose paint pans or something like that to hold your mud but these mud pans are more convenient. They’re designed properly to make it easy for you to gain access to the mud when you need it. Finding mud pans will not be difficult because they are available just about anywhere you would normally look for supplies. They will be readily available at the hardware store and you will probably be able to find some options in your local department store as well. If you want one that is going to last you for a long time, it might be worth it to pick up an aluminum one. They also come in plastic but the aluminum pans are going to have a longer life. 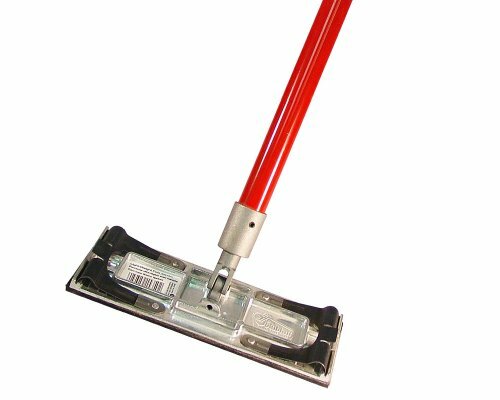 A pry bar will be very helpful when you are removing old drywall or paneling from the wall. This is going to be an essential step that will be made much easier when you have a sturdy bar to use. Buying a good pry bar will allow you to do what you need to do very quickly. 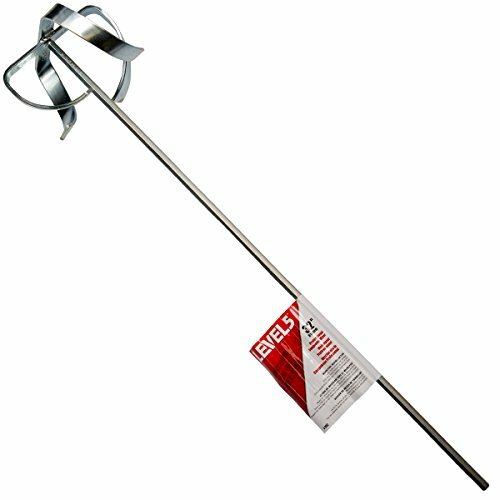 You can get a nice pry bar without having to spend too much money so definitely make sure that you have access to one. This particular pry bar is extendable and it allows you to reach out with it further. The good thing about buying one of these pry bars is that you will find plenty of uses for it outside of drywall jobs. There are going to be many instances where you will want a pry bar when doing home renovations so it’s smart to keep one handy. You can find these at just about any hardware store and even some department stores so make sure that you buy a good one. You’re going to need a good drywall hammer if you are going to hang the drywall with traditional nails. These drywall hammers differ from a traditional hammer in how they are designed. These are meant for driving nails into drywall with precision. You will have an easier time using a drywall hammer than you would a traditional hammer so it’s worth it to purchase what you need. Buying a good drywall hammer isn’t something that is going to set you back too much, either. These drywall hammers aren’t inexpensive but they aren’t exorbitantly priced either. You’ll be able to purchase a high-quality drywall hammer at any major hardware store. Seek one out and make your drywall experience go as smoothly as possible. You need to own a drywall t-square if you plan on doing a good job with your drywall job. 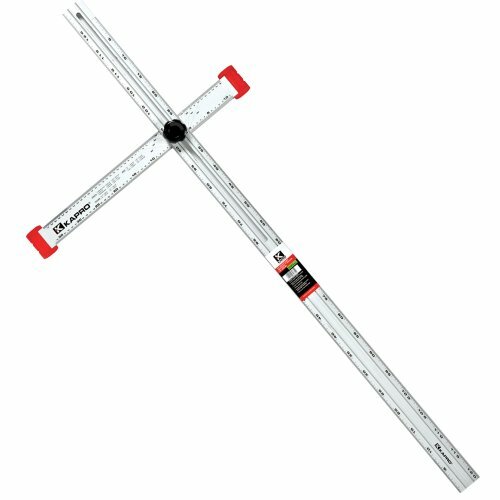 The t-square allows you to measure things with great precision to ensure that you are hanging drywall straight. You will get the best results when you use a t-square so buying one is the best choice that you can make. It is possible to measure things with a tape measuring tool but the t-square is going to be more accurate and easier to use for the purpose of hanging drywall. Seeking one of these out should be among the first steps that you take. When you know that you need to hang drywall in your home, you need to take steps to ensure that the job is done right. Being able to make accurate measurements is going to be imperative when doing this job. Your results are going to be good when you use this drywall t-square properly. Drywall knives are a necessity when you have a drywall job to do. 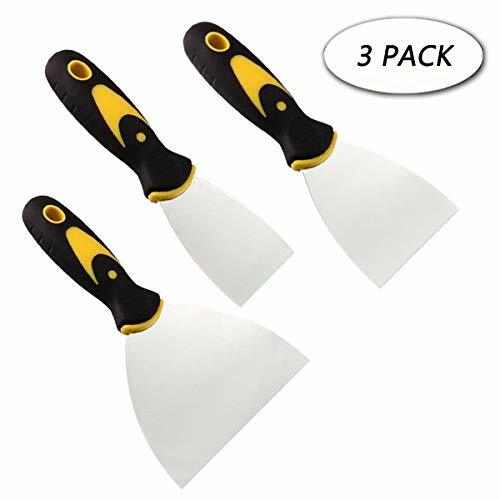 These knives are made specifically for smoothing out drywall. You will likely want to purchase several of these because you’re going to be using them a lot. The pack that is being shown off here has three drywall knives included. Smoothing out your mud on the drywall is going to be a lot easier when you have a good drywall knife. If you try to use something else, the results that you get will likely be mixed at best. It is always important to buy the right tools for the job so do your best to get drywall knives that you can rely on. This will make your drywall experience that much easier and these don’t cost a lot of money to buy anyway. Power drills are used for a few different purposes when it comes to drywall. Some people use cordless power drills to drive screws into the wall when they’re hanging the drywall. This might be more convenient for you than using a drywall hammer. It depends partly on your preference but this is likely to be the quickest method. Also, people use power drills to help mix up their mud. Mud needs to be mixed until it has the consistency of cake frosting and using a power drill to mix things up is going to make your life a lot easier. You can mix the mud by hand as well so it’s up to you which route you want to take. Regardless, a power drill is going to be very useful for you to own. This is the attachment that you will want to purchase for your power drill. You will need a power drill in order to make use of this attachment. It will work in tandem with your drill in order to mix up your mud properly. This is going to make the process of mixing mud so much simpler that you won’t likely want to go back to mixing it by hand. This attachment has a very sturdy carbon steel design. You will be able to use this attachment for many years and it will always make mixing mud a breeze. It can also be used very effectively to mix paint so you will have a use for it even after your drywall job is completed. This is a great drill attachment to have at your disposal so you should purchase this if you want to make your drywall experience more pleasant. Utility knives are going to be very useful throughout your entire drywall job. There are going to be times when you will need to make cuts and having these knives around will allow you to do things swiftly. These knives are very sharp and they’re portable. You can keep one of these on your tool belt so that you will have easy access whenever there is a need. This set of knives is a really good buy that you should consider. It includes three different utility knives that are all very high-quality. If you have people helping you out, then you can give the other two knives to your helpers to make the process even easier. This is handy for solo workers as well, though, as having more knives is always a good thing. You’re going to need to buy a couple of different drywall sanding sponges to help make your job go as smoothly as possible. It is highly recommended that you buy an abrasive sponge and a non-abrasive sponge. This will allow you to do everything that you need to do in regards to sanding. The sanding process can be a bit tedious but so long as you have the proper tools available to you, it won’t be too arduous. The sponge being shown here is a great all-purpose drywall sponge. Sanding is something that you won’t want to ignore so getting the right materials is imperative. Once everything is sanded down just right, you will be able to get things ready for the final touches. Your whole room will really be coming together at this point and that should give you the final motivation you need to push through and finish your sanding job. Getting a pole sander is going to make sanding a lot easier. You can purchase these at a fair price so it is definitely worth the small investment that you will have to make. Sometimes you will find that pole sanders are sold in two parts but this model here has everything that you need. This contains both the pole and the sanding head in one package so it’s a convenient purchase. You can use the pole to sand the drywall that is higher up more effectively. This will allow you to avoid climbing ladders or using drywall stilts in many situations. Some people are very adverse to climbing ladders so this is going to be pretty useful to you. If you don’t have tall ceilings, then you may not need this pole as much but it will still be good to have around. A jab saw is an absolute necessity when you have a drywall job to do. These types of saws are going to be capable of cutting your drywall accurately. They are specifically made for this purpose and you will have a smooth experience using one. Using a manual saw is a lot easier for people who aren’t used to cutting drywall in many ways as you can go at your own pace and ensure that you get a straight cut. Getting an even cut should be pretty easy with this jab saw. Just take your time and ensure that you have measured everything out properly using your t-square. You will be well on your way to completing your drywall job once you have finished your cuts. Buying a good jab saw will be simple too as you can find them just about anywhere that tools are sold. Owning a handheld router is going to be great for when you need to cut out small sections around your drywall. This is something that people use when they need to cut out a small square for an electrical outlet. You can do this with a manual saw as well but it is going to be significantly faster to use this router. It won’t take you long to be able to cut out your square and you will be able to do the job with great precision. Using a handheld router such as this feels great. You won’t have any trouble holding it as it is actually pretty lightweight overall. This is a tool that will be useful to you for things other than drywall as well. This is a highly recommended purchase but you can get by without it if you need to. There are going to be certain situations where drywall needs to be hung in tall places. Some ceilings are very high and there are going to be drywall panels that you cannot reach from a normal standing position. For this reason, it is crucial that you have access to a sturdy ladder. This is going to make reaching the high areas of the home much easier and you will be able to feel safe while you’re climbing. For most situations, a good six-foot-tall stepladder is going to do the trick. You won’t need to worry about getting an incredibly tall ladder unless the job calls for it. The ladder being shown below has a convenient platform that you can use to hold your mud pan when you’re working. This is a convenient ladder to own when you have a drywall job to do so you should definitely consider purchasing it if you have a need. Drywall stilts are sometimes necessary when you need to be able to reach high areas. This is going to be an important step when you have a job where you need to hang something that is high up. You could use a ladder to do the job but some people are going to feel more natural on drywall stilts. This is going to potentially allow you more maneuverability but you will need to be able to use these drywall stilts properly. This is a tool that is going to be useful to professionals who know what they are doing. 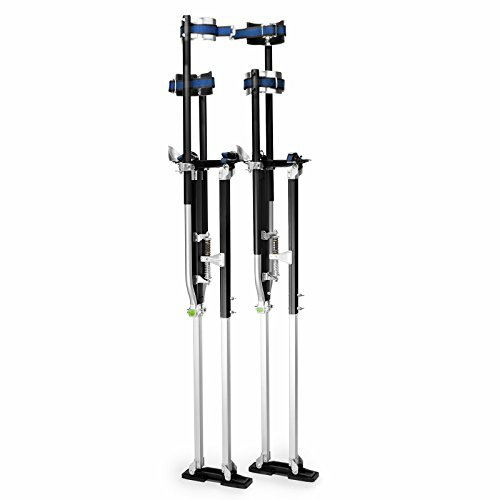 Amateurs who aren’t experienced with balancing on stilts such as this would be more likely to hurt themselves than to produce positive results. Only purchase these if you know that you can walk on stilts. If you aren’t confident in yourself then it would be best to simply use your ladder. The benefit of these drywall stilts over a ladder is going to be that you won’t need to keep stepping down to reposition your ladder. This makes it a bit more of a streamlined process. Weigh the pros and cons along with your own abilities. This will help you to determine if drywall stilts are right for you. This is a tool that you might decide to purchase instead of using a traditional drywall hammer and nails. You can use the auto feed screwdriver to drive screws in right where you need them to be. This is a convenient and hassle-free way to hang drywall. It is going to be capable of driving the screws in at just the right depth so you won’t have to worry about whether it was done properly. Simply having access to a tool such as this is going to save you an ample amount of time. It won’t take you nearly as long to hang your drywall if you have an auto feed screwdriver and you will feel as if the process is easier. This isn’t necessary to get the job done but the fact that it can help you to make short work of hanging drywall is a good reason to buy it. This is going to be a handy tool that will work well for you in other areas of home renovation as well so it is highly recommended. Drywall lifters aren’t a tool that you are going to need to complete your job, in all likelihood. This is another one of those tools that is really nice to have but doesn’t wind up being an absolute necessity. 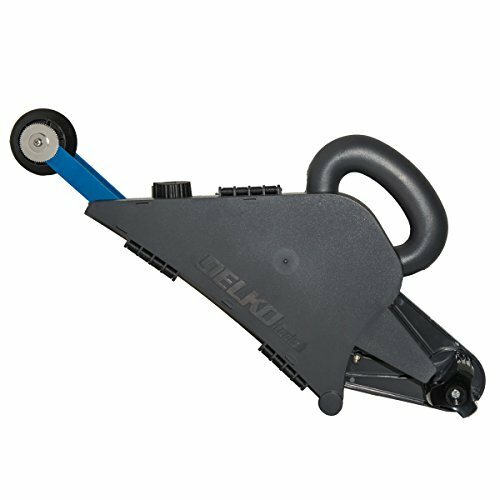 This tool will help you to hoist drywall panels and it is strong enough to carry a maximum workload of 150 pounds. You will have a much easier time doing your drywall hanging if you have access to this lifter. Sometimes drywall jobs require multiple people because you need someone to help you hold the drywall. 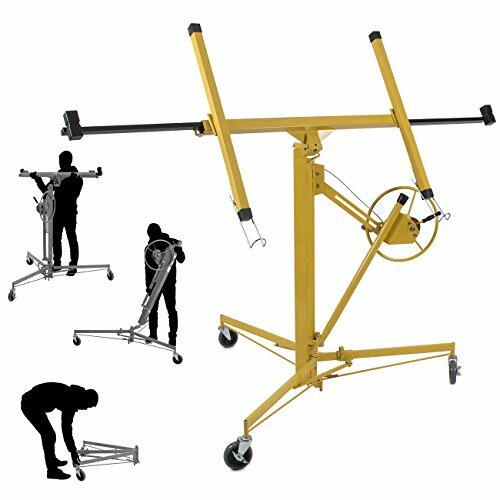 This lifter can essentially take the place of the second person who would normally be helping you. You will be able to complete drywall jobs by yourself and you won’t have to worry about keeping the second set of hands around. This is really convenient and works out well for both professionals and amateurs. The lifter might seem a bit pricey to some, but it is durable enough to last you for a lifetime. You won’t need to buy another drywall lifter if you purchase this one. It is going to prove useful to you and you will love how convenient it is. Seek one out if you know you’re going to be doing the drywall work all by yourself.